If i press view the message i see a login window with my remote utilities id. If i press return to windows the login dissapears. Is this normal? Is it a matter regarding user policy/rights... or is it maybe a security issue on my pc? Could you please show us a screenshot of the message? You can also send it via email to support@remote-utilities.com , just refer to this forum thread. If i press show program details it mentions the rutserv.exe file. Next time i see it i'll grab a photo. It doesn't happen very often. 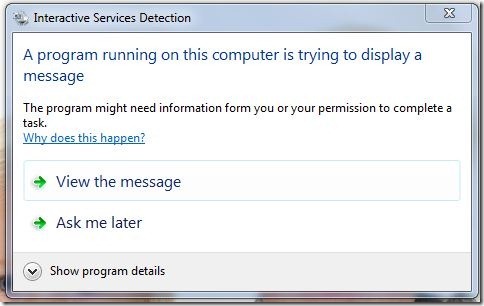 This is a Windows feature called "Interactive services detection". Looks like you have this feature enabled on your computer.